The first protected passenger transit vehicle to meet the Oil and Gas industry’s ATEX Zone 2 standard for operation in hazardous and explosive environments has been produced bySupacat, the Devon, UK, based specialist vehicle and engineering company. The Protected Transit Vehicle (PTV) will be operated by Agip ENI for transporting work crews between facilities on the man-made offshore island, Complex D, which has been created in the Experimental Phase of the Kashagan oil field development in the North Caspian Sea. The PTV is based upon a 4×4 Mercedes Sprinter adapted for safe use in exploration and extraction operations in the harsh environment and extreme weather conditions experienced in Kazakhstan. The PTV is fully ATEX Zone 2 compliant thereby providing the user with the utmost confidence and the employer with the requisite regulatory compliance and on-site safety. This week Supacat delivered the first PTV. In 2009 Agip KCO awarded Supacat a GBP 4.5 million contract for a fleet of seven PTVs, marking Supacat’s entry into the Oil and Gas sector where its experience in all-terrain military vehicles and hostile environment engineering are applicable to the sector’s specialist transportation requirements. Nick Ames, Managing Director of Supacat commented, “Supacat is geared to this type of bespoke, low rate production contract; but as a UK MoD prime contractor we have the engineering skills and management systems to handle the complex compliance procedures also demanded by the Oil & Gas sector”. The PTV occupants are protected from explosive hydrocarbons as well as toxic “sour gas” using an integrated Gas Detection System. Through constant hazardous gas monitoring, filtration and an over-pressured interior, the PTV creates a safe working environment. The PTV’s non-incendiary protection includes a water-cooled exhaust and turbo system and full electrostatic protection against sparks. When the PTV detects a hazardous gas it initiates an evacuation sequence that disables the engine, ventilation system and all non-ATEX rated equipment. Simultaneously, visual and audible alarms inform both the occupants and surrounding personnel of the threat. The residual over-pressure and sealed interior provide protection from toxic gas ingress to allow the crew time to don evacuation breathing apparatus. Designed for use in challenging environmental conditions, the fully insulated PTV is capable of operating in extreme temperatures whilst maintaining a habitable environment for the occupants. Sustainable manufacturing and growth in the UK’s process industries are to be stimulated through government investment of up to GBP5 million in innovative research and development. The UK’s innovation agency, the Technology Strategy Board (www.innovateuk.org) is to award grant funding to support business-led feasibility and collaborative R&D projects that will lead to the development and commercialisation of innovative approaches to sustainable manufacturing for the process industry. Sustainable manufacturing is of critical importance across the full range of process industries, including sectors such as chemicals, pharmaceuticals, coatings & lubricants, food & drink, oil & fuel, mining and construction materials. In such sectors there is a drive for faster, more effective product design and manufacture in order to become more globally competitive. On the coast of the Yucatan, in Mahahual, 300 miles south of Cancun, Nick Denbow runs the Western Caribbean Fly Fishing School. This is not where you would expect to find a Hampshire chalk stream trained dry fly fisherman, equipped with the best fly fishing rods and reels, but the weather is better, and the water is warm, all the year round. So now Nick fishes for Permit, and Jacks, and lobsters and octopus when they are around and he wants something for lunch. The fly fishing school is on the beach, just near Nohoch Kay, a really good beach front bar and restaurant, which gives him something to do, as well as sailing in one of their Hobbycats or snorkeling inside the reef, while waiting for fishing clients. But just behind the shore line round Mahahual there are several inland lakes, where for a proper day fishing you can persuade him to take a boat out and fish for Tarpon or goodness knows what else, there are a few crocodiles too. Hobbycat runs in the lagoon inside the reef off Mahahual: that’s Nick Denbow (senior) hanging on in the lowest possible point! 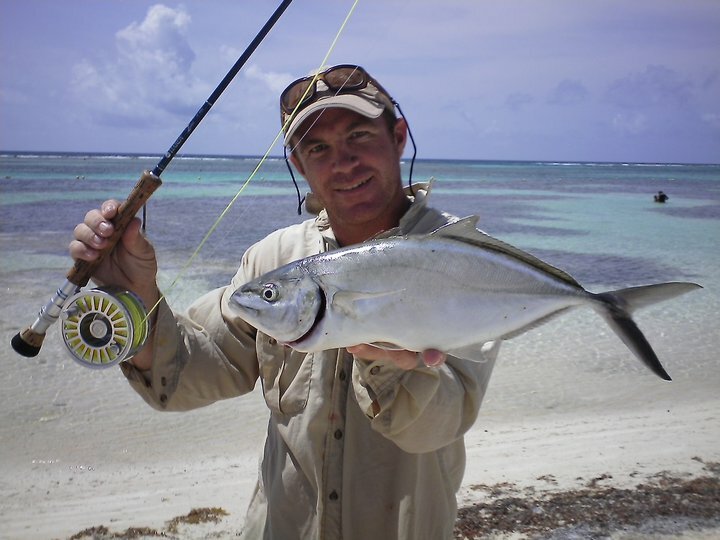 Find more about the life here on http://www.Youtube.com, just enter ‘Nick Denbow’ as a search term, or ‘Fly fishing in the Caribbean’. Contact Nick to arrange a day or more fishing off the beach or in the lakes, on twcffs@gmail.com, or look for him on Facebook. New for 2015 there’s a real and impressive website: http://www.catchafish.net! Most Caribbean cruise liners seem to stop at Mahahual in southern Mexico these days, so you can even arrange a day’s fishing as an excursion from the liner, and its a lot less expensive than what the cruise liners will want to sell you. See the Nohoch Kay reviews on Facebook too. This is not a new sideline for the Industrial Instrumentation Insider editor and normal author of this blog: its a younger version, Nick Denbow, Spanish-speaking son of Nick Denbow the Insider editor: the younger Nick has been living in Mexico for some 8 years, hence the occasional editorials from here on Mexican beach and environment topics. Even the hurricanes don’t seem to have put him off yet. Actually most of the rest of the family seem to speak Spanish too, even the ones in Cornwall, so I don’t need to!